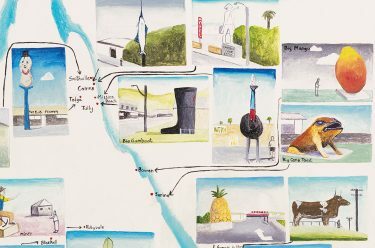 The Gallery has been gifted three of Brisbane-born artist Noel McKenna’s map paintings, the artist’s gentle and good humoured appreciation for the ‘things’ of Australia makes us better acquainted with our country, and with ourselves. Peter McKay profiles our three new works and delves into their inspiration. 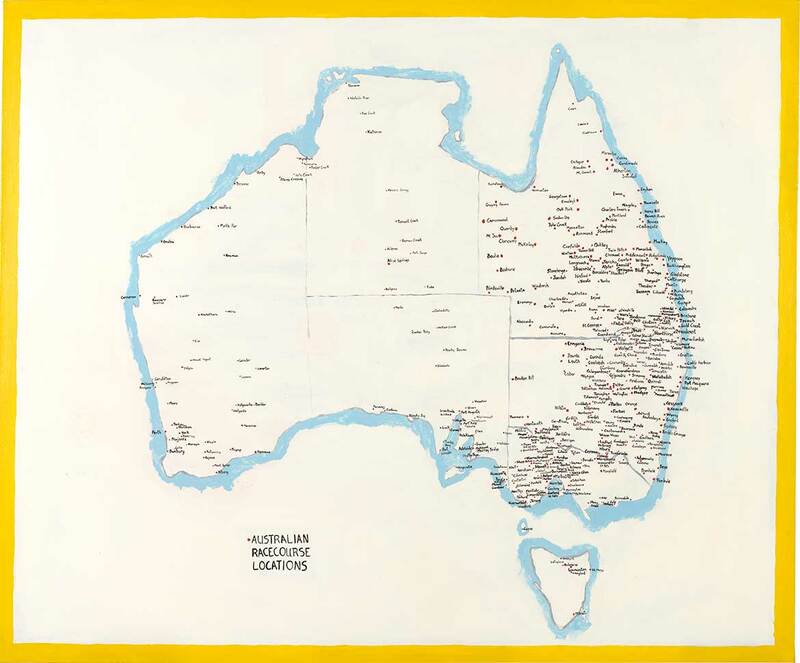 Australian Racecourse Locations 2002 is, in fact, the first in McKenna’s ‘Map’ series. McKenna has been a horseracing enthusiast since the age of ten when his father, Jim, first took him to a meet. Captivated by the competition and camaraderie of the jockeys, bookmakers, trainers — and, of course, the magnificence of the horses — he also saw that his usually quiet father seemed to belong at the races. McKenna began researching racecourses around the country well before the internet became the comprehensive resource it is today, writing to hundreds of regional post offices to ask them if they had a local racetrack. ‘The majority replied to me — one from Laverton in Western Australia even went out and photographed the track for me,’ McKenna says. Free of imagery or adornment beyond the red locations dots, the understated ambition of this work draws viewers in as they turn through their own memories to try to locate the ones they know of, and undoubtedly registering new ones in the process. Not just a hippophile but an all-round animal person, McKenna also painted an illustrated guide to the Birds of Australia in 2004. 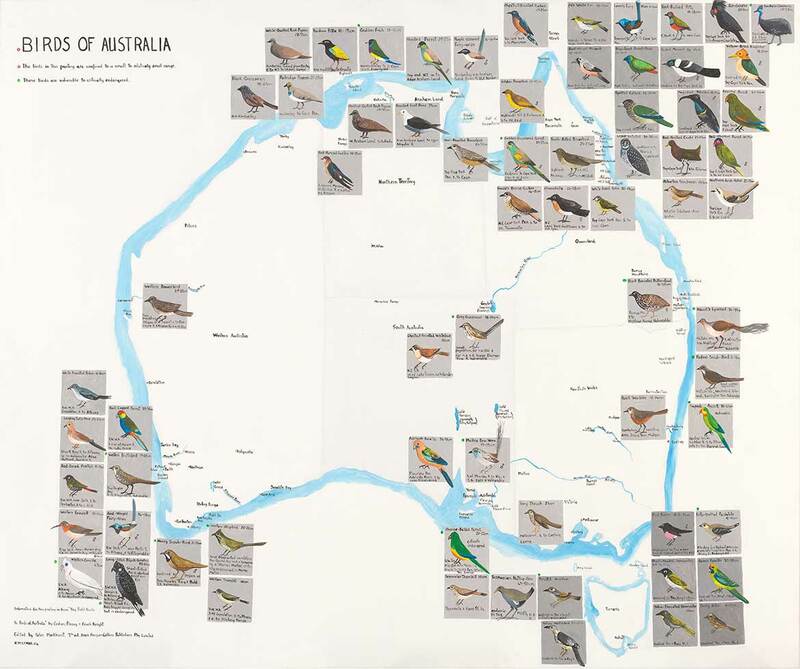 Known for his portraits of pet birds, McKenna sourced these images from The Field Guide to Birds of Australia by Graham Pizzey and Frank Knight, making use of its precision and accuracy. In spite of the exacting nature of this source material, it seems McKenna’s renditions can’t help but exude a little hop and flutter. While we might look at birds and dream of the great distances they travel, McKenna’s birds are mostly of the stay-at-home variety. 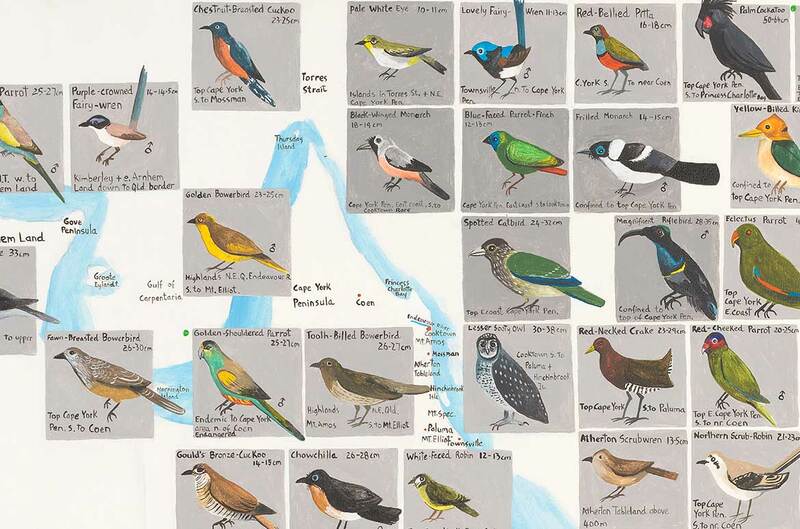 Soon after starting his research, he quickly realised the scale of the task, given Australia’s nearly 900 recorded bird species: ‘I would have trouble getting them all on the size of map I had been doing, so I decided to do just birds that lived in a limited area, as well as endangered ones.’ Of the 69 species in McKenna’s painting, 17 are identified as vulnerable or critically endangered, including the Black-breasted Button-quail and Albert’s lyrebird, both found in south-east Queensland. 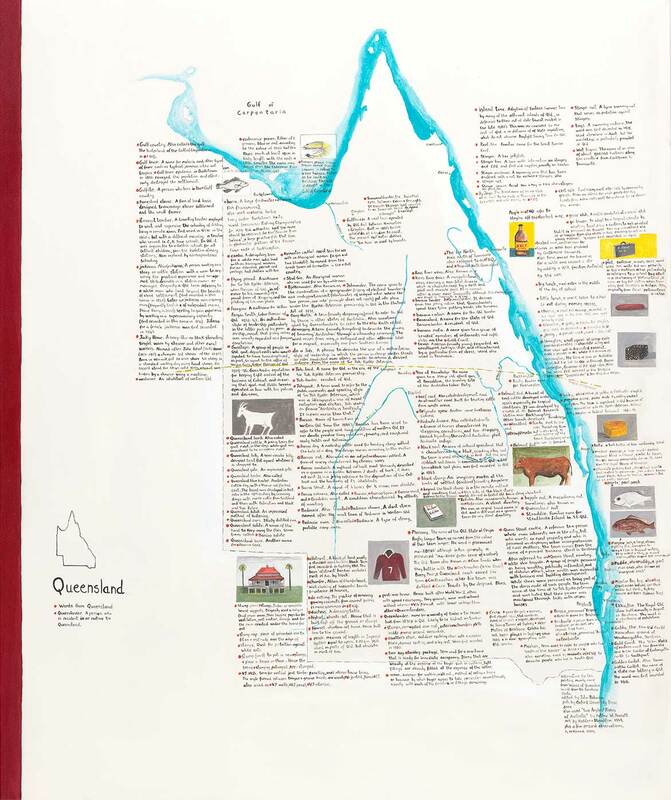 Queenslander 2004 is another work of great personal significance to the artist, reflecting on the distinct Queensland vernacular and history that became much more apparent to McKenna after he relocated over the border in his early twenties. ‘After moving to Sydney, for the first couple of years, I was often called a “banana bender” when I mentioned to people that I had moved down from Brisbane,’ he says. ‘Queenslanders in the 1970s were seen as being not quite as sophisticated as people from Sydney and Melbourne and I think we believed it ourselves.’ Full of social, political and culinary insights, Queenslander is a work of endearing self-reflection and self-confidence. In our digital world, the construction of physical maps becomes an absurd labour. Yet McKenna’s sincere interest in his subjects makes these maps a labour of love and good humour. 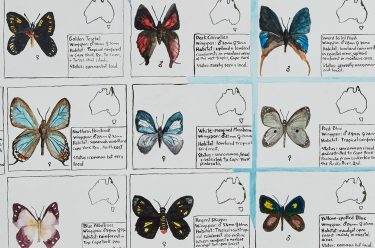 McKenna’s gentle appreciation for the ‘things’ of Australia, and his enthusiasm for classification, description and location makes us better acquainted with our country, and with ourselves. READ more on Noel McKenna / SUBSCRIBE to our YouTube channel to keep up-to-date with our latest videos and hear directly from the artists.